This document describes how to use the ORI Control & Management Protocol (OCP) feature in OpenDaylight. This document contains overview, scope, architecture and design, installation, configuration and tutorial sections for the feature. OCP is an ETSI standard protocol for control and management of Remote Radio Head (RRH) equipment. The OCP Project addresses the need for a southbound plugin that allows applications and controller services to interact with RRHs using OCP. The OCP southbound plugin will allow applications acting as a Radio Equipment Control (REC) to interact with RRHs that support an OCP agent. It is foreseen that, in 5G, C-RAN will use the packet-based Transport-SDN (T-SDN) as the fronthaul network to transport both control plane and user plane data between RRHs and BBUs. As a result, the addition of the OCP plugin to OpenDaylight will make it possible to build an RRH controller on top of OpenDaylight to centrally manage deployed RRHs, as well as integrating the RRH controller with T-SDN on one single platform, achieving the joint RRH and fronthaul network provisioning in C-RAN. OCP is a vendor-neutral standard communications interface defined to enable control and management between RE and REC of an ORI architecture. The OCP Plugin supports the implementation of the OCP specification; it is based on the Model Driven Service Abstraction Layer (MD-SAL) architecture. 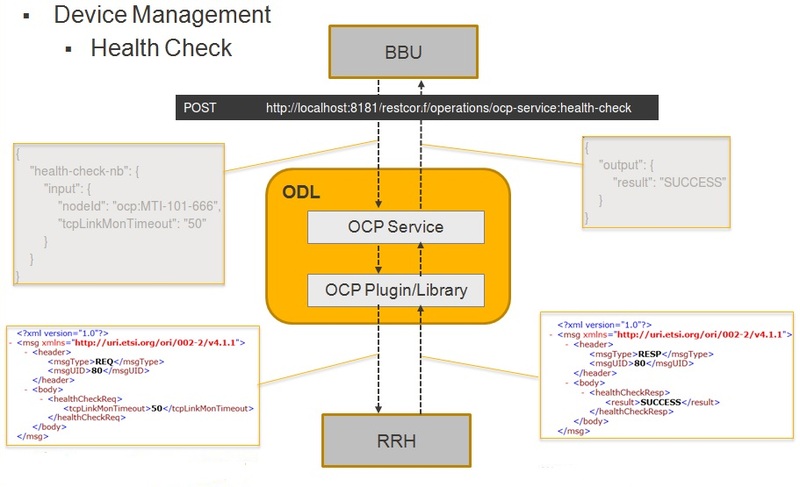 OCP protocol library is a component in OpenDaylight that mediates communication between OpenDaylight controller and RRHs supporting OCP protocol. Its primary goal is to provide the OCP Plugin with communication channel that can be used for managing RRHs. OCP Service addresses the need for a northbound interface that allows applications and other controller services to interact with RRHs using OCP, by providing API for abstracting OCP operations. The OCP service (odl-ocpplugin-app-ocp-service), together with the OCP southbound (odl-ocpplugin-southbound) and OCP protocol library (odl-ocpjava-protocol), provides OpenDaylight with basic OCP v4.1.1 functionality. You can interact with OCP service via RESTCONF, so you have to install the following features to enable RESTCONF. Then install the odl-ocpplugin-all feature which includes the odl-ocpplugin-southbound and odl-ocpplugin-app-ocp-service features. Note that the odl-ocpjava-all feature will be installed automatically as the odl-ocpplugin-southbound feature is dependent on the odl-ocpjava-protocol feature. After all required features are installed, use following command from karaf console to check and make sure features are correctly installed and initialized. Configuring the OCP plugin can be done via its configuration file, 62-ocpplugin.xml, which can be found in the <odl-install-dir>/etc/opendaylight/karaf/ directory. The OCP Plugin project contains a simple OCP agent for testing purposes; the agent has been designed specifically to act as a fake radio head device, giving you an idea of what it would look like during the OCP handshake taking place between the OCP agent and OpenDaylight (OCP plugin). To run the simple OCP agent, you have to first download its JAR file from OpenDaylight Nexus Repository. Then run the agent with no arguments (assuming you already have JDK 1.8 or above installed) and it should display the usage that lists the expected arguments. The API is documented in the OCP Plugin Developer Guide under the section Southbound API and Northbound API, respectively.